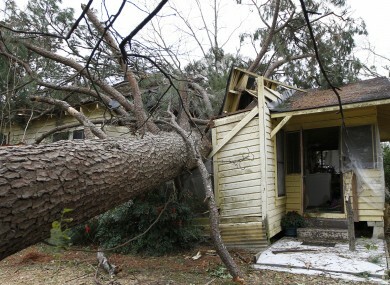 A tree blown over by a storm sits in the home of Martha Cavin in Centreville, Mississippi. Cavin had to be cut out from her home and was treated for a gash to her head. A POWERFUL WINTER storm system that pounded the nation’s midsection, wrecking holiday travel plans and dumping a record snowfall in Arkansas, began lashing the Northeast late yesterday with high winds, snow and sleet. The storm, which knocked out power to thousands of utility customers mainly in Arkansas, was blamed in at least six deaths. Hundreds of flights were cancelled or delayed, scores of motorists got stuck on icy roads or slid into drifts and blizzard warnings were issued amid snowy gusts of 30 mph that blanketed roads and windshields, at times causing whiteout conditions. The system, which spawned Gulf Coast region tornadoes on Christmas Day, pushed through the Upper Ohio Valley and headed into the Northeast overnight. High winds, snow and sleet slickened roads in Massachusetts, Rhode Island and Connecticut, causing dozens of minor accidents and spinouts. Forecasts called for 12 to 18 inches of snow inland from western New York to Maine into today. The National Weather Service said early this morning that snow was falling heavily in Pennsylvania, upstate New York and some New England states. Among the highest snow totals were 2 to five inches in southeastern Massachusetts, 3 to 6 inches in Connecticut, up to a foot in some Pennsylvania counties and 10 to 11 inches in some parts of western New York. The day after Christmas wasn’t expected to be particularly busy for AAA, but its Cincinnati-area branch had its busiest Wednesday of the year. By mid-afternoon, nearly 400 members had been helped with tows, jump starts and other aid, with calls still coming in, spokesman Mike Mills said. More than 1,600 flights were canceled, according to the aviation tracking website FlightAware.com, and some airlines said they would waive change fees. Lengthy delays were reported Wednesday at the three major New York City-area airports, the Federal Aviation Administration said. In Arkansas, some of the nearly 200,000 people who lost power could be without it for as long as a week because of snapped poles and wires after ice and 10 inches of snow coated power lines, said the state’s largest utility, Entergy Arkansas. Email “Pics: Snowstorms batter the US midwest and head east ”. Feedback on “Pics: Snowstorms batter the US midwest and head east ”.